I am still amazed some days when I walk into my kitchen and see my Frigidaire stainless steel refrigerator. If you've been reading this summer, you know that thanks to Mom Central and Frigidaire, I've been a test drive mom for Frigidaire's new appliance line. They had a new refrigerator delivered and installed in our kitchen last June and we've been testing it out ever since! 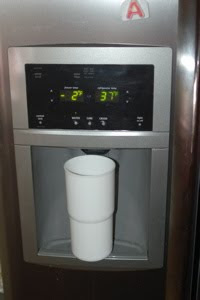 One of my favorite features of this refrigerator is the water and ice dispenser on the door. It's at a convenient height so my boys can easily get their own ice and water (tip: make sure cups are also at a kid-friendly height!) My 2yo can get her own if she moves the step stool over (which she does!) If I want to turn off the ice and water, I can do that by simply pushing a button to lock those features out! I admit I thought I'd be doing that more often, but Lydia actually does a great job of filling her cups only half-full so I don't have a lot of water being poured out on the kitchen floor. Another thing I like about the water and ice dispenser is that the opening is deep. The cup shown in the picture is the tallest cup I own and did not fit in our old water dispenser. You can see that it fits just fine into this one. I can also fit my 3 quart iced tea pitcher easily - so I can fill it up with water, and then ice. I like that I can choose crushed or cubed ice. I prefer crushed ice in my drinks, and I don't have to pull out a separate ice crusher to enjoy crushed ice. The water dispenser has a PureSource filter attached to it, so the water doesn't have as funny a taste as when it comes straight from the tap. Overall, we've been very happy with this refrigerator. And, I'm excited to remind you that Frigidaire is still running a contest to give *you* a chance to win free appliances! Head over to My MotherLoad and enter for a chance to win a new washer/dryer. While you're there, check out all the new time-saving appliances.